Cognitive development – As children manipulate differing materials during sensory play, they inherently learn concepts such as problem-solving, classifying and cause/effect. Learning what happens to dirt when you add water to it, or how to build a boat that will float encourages children to think for themselves, increasing their abilities to learn. Language development – Sensory play has been shown to increase a child’s use of language as they often like to talk about what it is they are experiencing. This excitement also increases their ability to work with others and to use appropriate social interactions. 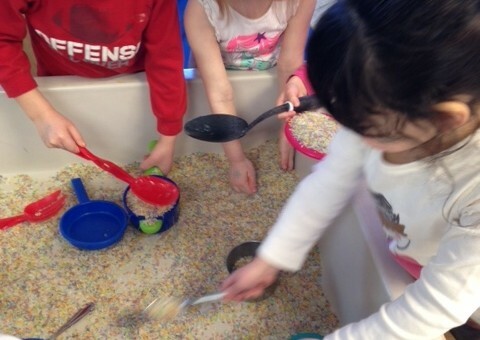 Physical development – By pouring, mixing, measuring and manipulating, children naturally increase their use of fine motor skills and eye/hand coordination as they learn how to tell their body what it is they want it to do. Creative development – Allowing children to use the process to create whatever it is they wanted, sensory play encourages creative development through a number of outlets. At Foundations for Learning, we firmly believe in the beneficial attributes of sensory play, encouraging our day care students to take advantage of our extensive sensory tables. Find out more about the differing educational opportunities for any age group by taking a tour of one of our child care locations in Milldale, Glastonbury and South Windsor. We welcome the opportunity to meet you and your family.